Ashley Fox (left) and Casey Lonabocker check out one of the four kiosks in the exhibit "What's in a Name?" at the Harvard Museum of Natural History. 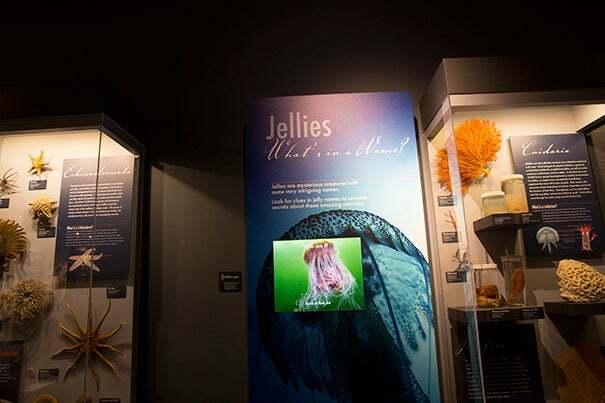 The exhibit's purpose is to clear up visitors’ confusion of scientific names through images, information, stories, and games. How do you tell a lion’s mane jellyfish from a hair jelly or a giant jelly? You could try by checking the scientific names. The lion’s mane jelly is Cyanea capillata. But the hair jelly also is named Cyanea capillata, and so is the giant jelly. If Shakespeare had waxed as poetic about jellyfish as he did about roses, he might have concluded that a lion’s mane by any other name would still be a lion’s mane: the world’s largest true jellyfish, big enough to eat fish that become ensnared in its 120-foot tentacles. One with a 7½-foot diameter bell washed ashore in Massachusetts in 1870. The Harvard Museum of Natural History (HMNH), along with institutional partners the Encyclopedia of Life and the Biodiversity Heritage Library, have waded into the sometimes murky waters of names that have been given to creatures, plants, and other organisms. Though the point of naming something is to provide a common language in which to talk about it, the proliferation of different common names for the same creature sometimes defeats the purpose. In the 1700s, science took a step toward clarity by giving species two-part Latin names, like Cyanea capillata for the lion’s mane jelly, or Homo sapiens for the humans who named it. The Harvard Museum of Natural History is debuting four “What’s in a Name?” kiosks to clear up visitors’ confusion through images, information, stories, and games. The kiosks, created with support from the Institute of Museum and Library Services, tackle the complexities of Toxicodendron radicans, or poison ivy, whose name means, essentially, “poison tree” and which is related to cashews and mangos. They also look at Apis mellifera, the honey bee or “honey-bearing bee”; the aforementioned lion’s mane; and the 300-million-year-old Dimetrodon milleri, a sail-backed carnivore that, contrary to popular belief, is not a dinosaur. 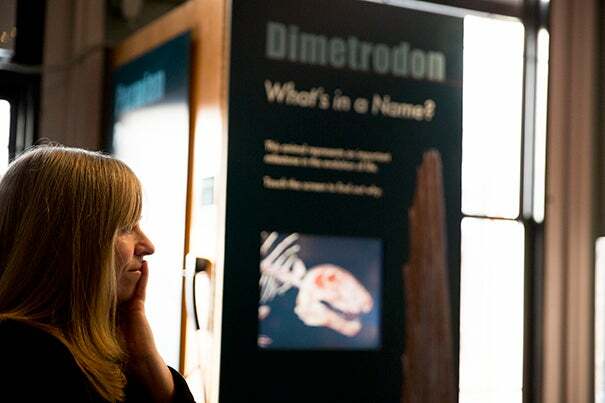 The kiosk explains it is not only older, predating dinosaurs by millions of years, but also is more closely related to mammals than to Triceratops — there is a skull at HMNH — or Tyrannosaurus rex. Scientific naming helps locate a species in the tree of life, because its two-part moniker includes both species and genus, the group of species to which it belongs. Scientists who discover or describe a new species typically are the ones who come up with names, which have to adhere to certain guidelines. The names sometimes reflect the place where a species is found, a discoverer or colleague’s name, or even just a sense of fun. The Dimetrodon on display at HMNH, for example, takes its full name from Paul Miller of the Field Museum of Natural History in Chicago. Miller is a colleague of the beast’s discoverer, paleontologist and former Museum of Comparative Zoology director Alfred Romer. A newly described tarantula, discovered near Folsom State Prison in California, was named Aphonopelma johnnycashi, for the singer who gave a famous concert there in 1968. Then, of course there’s the sponge-like fungus whose name any child would recognize: Spongiforma squarepantsii. “It shows scientists have a sense of humor and, [because names are] not always funny, a sense of culture,” said Jane Pickering, executive director of the Harvard Museums of Science and Culture, of which the HMNH is part. But scientific names aren’t always forever, according to Pierce. Because the first part of the name is its genus, if scientific consensus about which group it belongs in changes, the name will change too. Pierce said scientists are learning new things about species all the time, and this new evidence — or even re-evaluations of old evidence — sometimes means a name change. To spread the word about the topic, the HMNH and partner organizations have created a downloadable ebook, available on the museum’s website, that includes photographs, descriptions, and the stories of several additional species beyond the four whose tales are told in the kiosks. “We really want people to understand both the importance of scientific naming and also the process you go through,” Pickering said. "What drew me to the job was that this is a teaching museum, and there is a collaborative nature to its curatorial and educational programming," said Makeda Best, who was recently named the Harvard Art Museums' Richard L. Menschel Curator of Photography.